Most racing games on the touch screen either present on-screen control sticks, or attempt to take something out of the equation, like acceleration. Swing Racers doesnt anything away - a completely original control scheme that feels natural, fun and intuitive while being challenging to master! 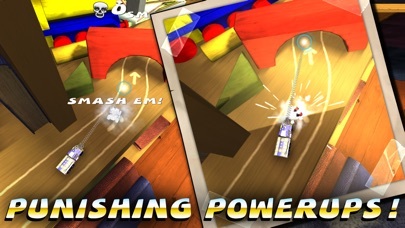 Truly addictive and unique with NO IN-APP PURCHASES, Swing Racers is a game for all ages. Watch the awesome-looking levels fly by as you race, courtesy of the award winning Unreal® Engine 3. The game is tested and working on all iPads, and on iPhones & iPods that support iOS 7 or above. 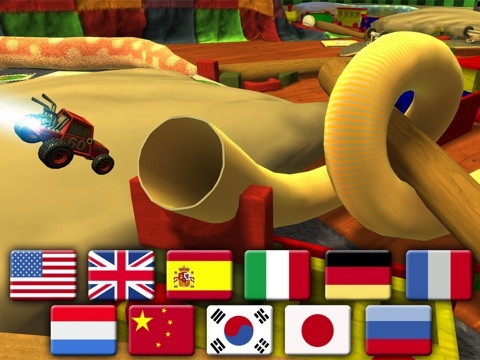 #1 Racing Game on the App Store in 39 countries, including UK, Australia, France, Germany, Italy & Japan! 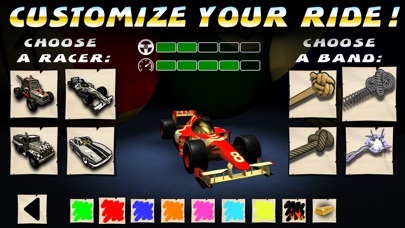 Swing Racers is a 3D racing game with unique controls - swing your car around the house with a rubber band - the further you pull, the faster you go but the harder it becomes! 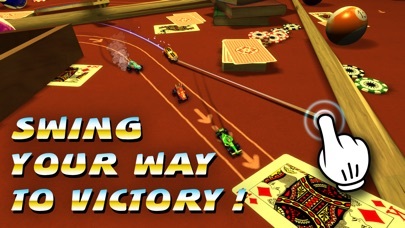 Truly addictive and unique with NO IN-APP PURCHASES, Swing Racers is a game for all ages. "The simple system works remarkably well" ... "The game looks great!" 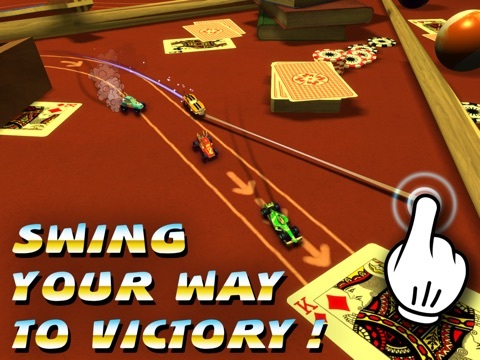 - Pocket Gamer "The control scheme allows for a great deal of precision to drive your car exactly where you want" - Apple'n'Apps Most racing games on the touch screen either present on-screen control sticks, or attempt to take something out of the equation, like acceleration. Swing Racers doesn’t anything away - a completely original control scheme that feels natural, fun and intuitive while being challenging to master! 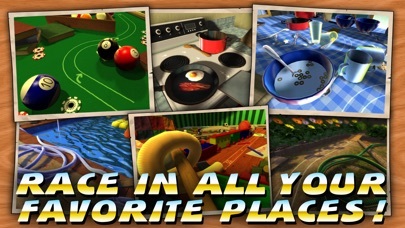 If you experience any problems please send us feedback at www.moreporkgames.com/contact OODLES OF AWESOME TRACKS Swing and fling your way through 15 tracks in your favourite household environments, including messy bedrooms, dinner tables, kitchen sinks, pool tables, gardens and more! 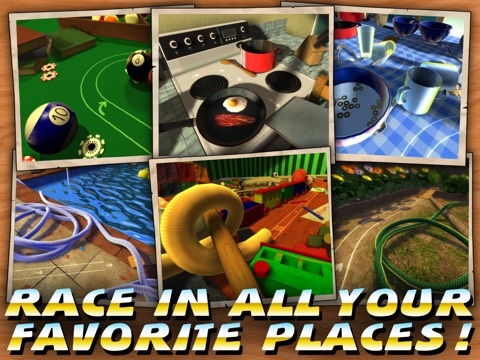 Bonus levels included for some extra non-racing fun! PUNISHING POWERUPS Burn your opponents with a fireball or freeze them and smash them to pieces! Zap them with lightning, or leave trails of sticky goo and slippery oil for them to drive into! 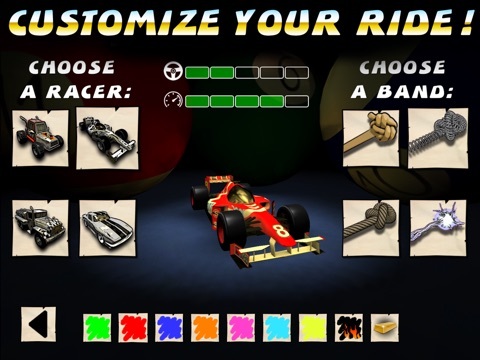 CUSTOMIZE YOUR RIDE Unlock new cars and new rubber bands to enhance your speed and handling + cool paint jobs just for the looks! BEAT THE GUY WHO MADE THE GAME Race against your own ghost, or achieve all goals on a track to unlock the Developer Ghost! No one beats the developer! STUNNING GRAPHICS Watch the awesome-looking levels fly by as you race, courtesy of the award winning Unreal® Engine 3. The game is tested and working on all iPads, and on iPhones & iPods that support iOS 7 or above. 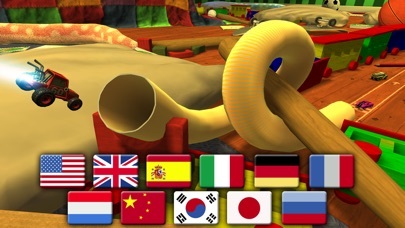 ACHIEVEMENTS AND LEADERBOARDS Leaderboards for each track and plenty of cool achievements to challenge the best players! FULLY TRANSLATED FOR 11 LANGUAGES Spanish, Italian, German, French, Chinese, Korean, Japanese, Russian & Dutch! VOTE FOR YOUR LANGUAGE TO BE ADDED TO THE GAME HERE! - http://poll.fm/5boh7 Play it today! Looks really nice! I'll most likely download this after work and leave some impressions if someone doesn't beat me to it. Well, the App Store trailer sold me. Looks fantastic in motion. Looks like there's vehicle customization, upgrades, cheevos, and leaderboards. I'm in. Just played the first level. I like it so far. The controls are a little awkward, but it may just take some getting used to. There are a bunch of goals for each level, leaderboards, and achievements. I'll need more time to leave deeper impressions, but if you're slightly interested, I'd say it's worth a download for sure. This looks kind of cool. Looks like it controls like the F1 game Codemasters did. I'm sure I'll pick it up. So, to elaborate a little more... You control your car by placing your favorite digit in front of it, pulling it along and turning with a rubber band. It's a neat concept and it works pretty well once you get the hang of it. You can unlock different types of 'rubber bands', each having their own effect on your steering and speed. You can also earn new vehicles and customize them with different paint jobs. The levels are extremely detailed, and include kitchen countertops, backyards (complete with garden hoses, grass, etc. ), billiard tables and more. 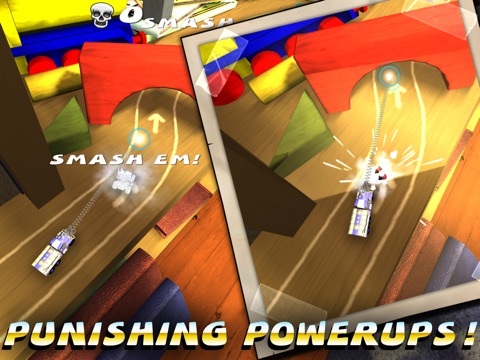 There are several powerups on the tracks to use against your AI opponents. There are speed boosts and stars as well. Hmmm really quite fancy this. Do you have to hold your finger all,the time or it a case of pulling the band tight (so to speak) and letting go? You hold all the time. Stretching farther away makes you go faster, and moving in closer to the car makes you slow down. Thanks for the kind words AnotherKellyDown! Greatful for anyone who gives their vote for the forums game of the week. We will be releasing a small update tomorrow that adds Dutch translation. After that will be a couple of updates with several new tracks and new cars! First of all congrats on the release of your awesome game! I like the path drawing mechanics. It feels like real-time Draw Racer! I like the power-ups on fields too! The interactions with the some of the tracks were awesome (reminds me slightly of Split/Second, where you use power plays to interact with the tracks), hope to have more of them! AI is rather fair; they will wait for you if you're behind and try to keep up with you when you are ahead. Some opinions I have though. The AIs feel a little dead and boring, they don't use power-ups themselves, they always take the same line (They don't feel like they were driven with rubber bands, more like just using a regular driving wheel, but this is purely my opinion, others might feel differently) and you don't get to interact with them much. Also, Demolition Derby on Turbo Mode seems neigh impossible to beat. The AIs always seem to get SO far ahead in the first part of the track (where the waters and the grass are), and in the second half of the track they will slow down but it always feel that they are always get ahead of you no matter what. Also, this is the weirdest track where you can affect the AI and by doing so, they go completely off-course and crash, allowing you to get ahead but miraculously they will catch up and get ahead of you quickly enough. This track is the only track to get me my shock band! Thank you for your feedback FBI! Glad to hear you've completed so much of the game! Hope you've had fun along the way. Haha and I also have to apologize to the devs. I beat the dev ghosts on every track and saw the pretty hilarious picture tagged "Uh oh!" saying that the dev is sad because I beat him! I had the time with the Shock Band to screw around with the A.I.s , took more notice of their behaviour (when at first i was too concerned with achieving those objectives) and looks my impression of the A.I.s were wrong; they sometimes bang and wag at obstacles, proving they do drive like being pulled by rubber bands. Hopefully I'm right about this. Anyone else can confirm such behaviour? Just one last problem i have now: That Hard arena where i had to destroy 6 racers in 5 seconds. Can someone tell me how to go about completing this seemingly impossible task? Imo if it were 5 racers in 6 seconds it would be possible, but at current stage with the A.I.s dispersed at the corners after destroying the first 3, I can't seem to find a way to complete this. Help? Some bugs I've also seemed to have discovered. The achievements where you must complete a certain hard track without dying, it seems to be bugged. I can't get it even though I'm sure I didn't die. I even tried to not die after I finish the race, but nothing. Also, when starting off with the infinite shock band, I destroy the A.I.s but they seem to be still there as an invisible obstacle for a moment; this is a little annoying but I dunno whether this could possibly be intended. Lastly, there was this one time where i received a Fire power-up using the shock band, but after the Fire power-up was used up to destroy a racer, the shock band stopped working; the racers are no longer destroyed by the shock band. You are absolutely right - the AI literally get pulled with "invisible bands" just like the player. Some bugs I've also seemed to have discovered. The achievements where you must complete a certain hard track without dying, it seems to be bugged. I can't get it even though I'm sure I didn't die. I even tried to not die after I finish the race, but nothing. This is a tough one - have been trying to fix but the game center achievements system in general seems flakey so sometimes it works and sometimes it doesn't. Will continue to work on that. Lastly, there was this one time where i received a Fire power-up using the shock band, but after the Fire power-up was used up to destroy a racer, the shock band stopped working; the racers are no longer destroyed by the shock band. That's interesting - the fire pickup is not meant to be available while you are using the shock band - thank you for the report! In case anyone else reads this - I've sent some free Swing Racers App Store codes for giveaway to Touch Arcade today (10th July) so keep an eye out on their facebook page! Thanks! That tip on your site really helped! I was destroying all 3 of them at the very start right after the countdown is over and never seemed to get it. With your tip I finally got that last goal --- albeit with quite a fair bit of luck. Also, I forgot to raise this issue: I'm on an iPad Mini Retina and when I try to minimize the game using the five-finger pinch gesture, for some reason I would accidentally hit some button that brings me to your FaceBook page. This causes my Safari browser to open and I have to wait a while for Safari to load up properly. Minor frustration with that lag; would be nice if it could be resolved. I worked around it by pinching closer to the bottom of the screen (Where for every other app I simply use the whole screen space to pinch). Thank you VERY MUCH for reporting this, and especially the save files. Will be attempting to fix this today and submit an update (which can, unfortunately, take up to 10 days to get approved).